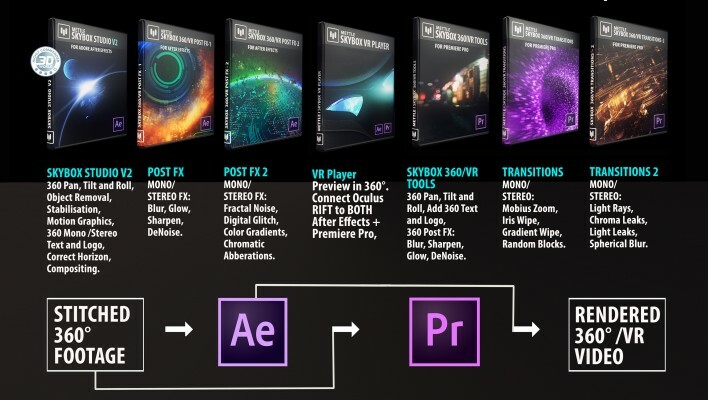 Cinematic 360/VR production tools for Adobe After Effects and Premiere Pro. Bundle price: $499. Bought separately: $1014. Save $515. Buy the SkyBox Suite bundle and save 50%. Cinematic Production Tools for 360/VR in After Effects and Premiere Pro. SkyBox 360/VR Tools are made for cinematic 360/VR Production in Premiere Pro. Effects can be applied directly on 360 footage or an Adjustment layer (great for transitions). We currently support Equirectangular format: mono 2:1 or Stereo 1:1 over-under. SkyBox Studio V2 is a set of 360/VR Production tools for Adobe After Effects. SkyBox 360/VR Transitions 2 are designed to add cinematic effects to your 360/VR productions. Made to work with 360 footage in Premiere Pro. SkyBox VR Player is a plugin that connects your Oculus Rift to Adobe After Effects and Premiere Pro (WIN).